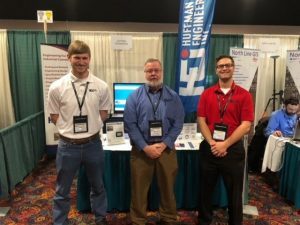 For the past several months Huffman Engineering, Inc. has been busy not only building our relationships with customers and vendors, but our team has been attending several conferences, seminars, and trainings. 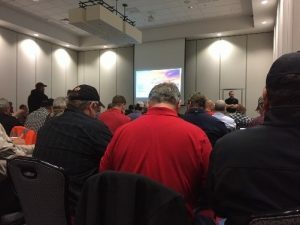 From the Colorado Rural Water Association (CRWA) conference to the recent CED/Rockwell Safety seminar we’ve had the opportunity to get out and interact with our customers and vendors. Attending the NRWA conference in March provided another opportunity to connect with our customers. There were some great presentations and learning opportunities. We brought back some ideas as to how we can better operate and explain to our customers the importance of approving those big projects that come with a hefty price tag. 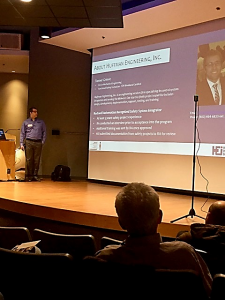 Huffman Engineering had the privilege of not only attending the safety seminar but had a booth and one of our mechanical engineers, Tanner Grieve, presented during the event this March. David Rasmussen was the keynote speaker and did an exceptional job relaying the importance of safety and how it can impact each facility. Tanner presented again about the importance of safety and but also provided several project examples that we have done with safety analysis, including our expertise, and what safety services we can offer our customers. Our continued presence at conferences offers the ability to interact one-on-one with our customers while allowing our engineers to attend different training presentations and grow as a member of the Huffman team. We look forward to our continued expansion in Nebraska and Colorado as it increases our availability to customers.